Today the author has written a piece about growing up with affordable creativity. I hope you enjoy it. Getting creative is often mistaken for being a super pricey hobby which entails multiple shopping trips, endless searching for the right colour card and picking out the ideal materials for an Insta perfect project. But the truth is that getting creative is actually way more affordable than you may think. My creative journey began with the amazing ideas of the classic children’s show Blue Peter. Making amazing toys and bric a brac from household items was a hit on the show and despite the many craft stores selling you ‘everything you need’, there’s a ton of creative items waiting in your kitchen cupboards. The best memory I have of a creative childhood is a remarkable model of Tracy Island from Thunderbirds. Made from papier mache and numerous recycled food containers, this homemade toy was a major highlight of mine and my brother’s childhood which we shall always treasure. Being creative with household items is still an easy and cheap way to get crafting, but it’s also an amazing way to recycle and bond with your children. Getting sticky and messy is all part of growing up and learning, so why not do it in a creative way? 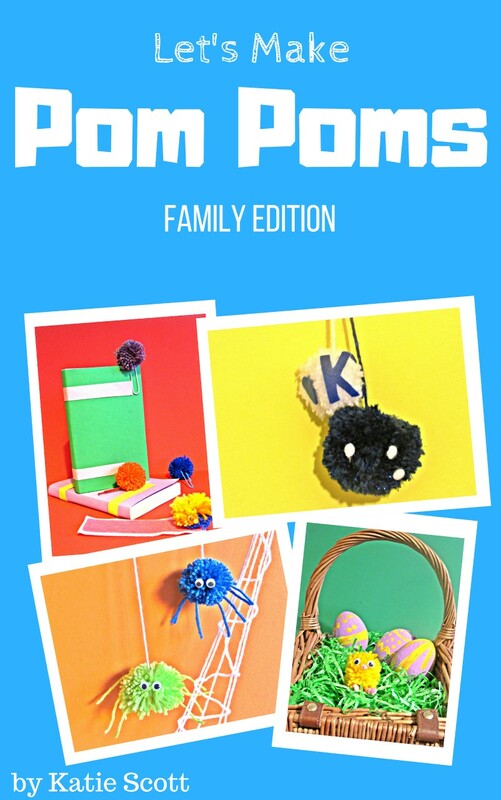 My debut craft book, Let’s Make Pom Poms: Family Edition, came about when I found a stash of odd bits of yarn. Instead of throwing them away, like I was going to, I kept hold of them and started making pom poms. With no particular goal at first, I was making the pom poms so my little lady could play with them. She loves her ball pit so these new fluffy alternatives were a new texture to introduce her to. It was this movement that reminded me that creativity really can begin at home, with no influence on your bank balance. What’s the best thing about all these items? They’re free. The saying goes that the best things in life are free and spending craft time with children is exactly that. A child won’t remember whether you bought branded craft items or gathered a secret stash from the cupboard. They’ll remember the quality time you spent with them being creative and getting messy. To me that is the most important asset to being creative at home. I grew up crafting toilet roll pencil holders and Easter gardens in fish bowls and to this day I still solidly believe that creativity is always affordable and is best enjoyed around the kitchen table. Try it out today with your family, roam the kitchen cupboards and see what creations you can make without spending a penny! Thank you, Katie Scott and Rachel’s Random Resources.